The off-season expectations are pretty high for Jack Zduriencik. With a few minor league deals in the books so far this winter, we can see that Jack is certainly working hard to make some deals. Our big question is: Just what kind of deals are the M's front office going to be able to pull off? Will they be the kind of moves that change the course of the franchise or are they going to be what has been deemed to be status quo? Yesterday, the M's made their first move that will effect the Major League roster. Trading rising star Josh Lueke to the Rays for left handed hitting catcher, John Jaso. Jaso, has played two seasons in the pros as well as spending time in the playoffs with Tampa Bay. A career .245 hitter with limited power numbers isn't going to be the guy to change our offensive woes around. Simply a way to round out our catching platoon and add a left handed bat. Miguel Olivo and Adam Moore are both right handed bats and Moore's health has been an issue the past couple of seasons. Jaso's health was an issue last season however, being injured in spring training and mid-season for 33 games, this seems to be another one of Jack Z's low risk moves in which there is a hope for a big reward. Hopefully not a sign of what our entire off-season will look like but just a warm up for bigger and better deals to come. Some good things about Jaso? He's from California and he is excited about coming back to the West Coast. He loves Safeco Field and is excited to play here everyday. He doesn't care that it's harder to hit HR's here because he's not a power hitter anyway. It appears that he is excited to come and play and hopes he has a huge turn-around from last years lower numbers at the plate. Waiting for those winter meetings to start, Jaso could just be a huge compliment to what the 2012 Mariners will be. We'll see! 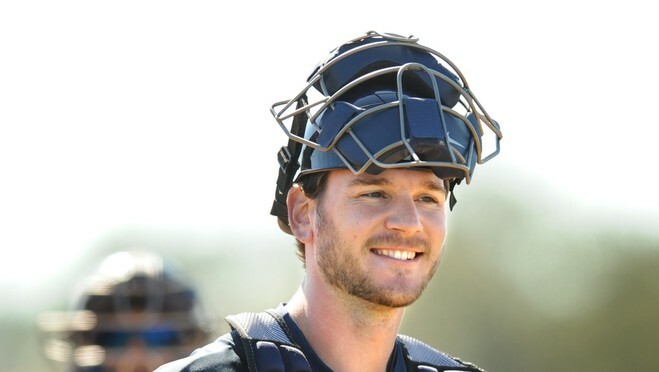 Welcome to the M's John Jaso!! !